The IOCCG Committee implements a regular rotation of scientific committee members (one of the requirements of an Affiliated Program of SCOR). Accordingly, Roland Doerffer rotated off the Committee at the end of the 19th IOCCG Committee meeting in Cape Town (28-30 January 2014). We would like to thank Roland for his outstanding commitment and many important contributions to the IOCCG Committee over the past few years. Three new IOCCG Committee members were nominated for 2014, including Cara Wilson (NOAA, USA), representing user services, Simon Bélanger (Université du Québec à Rimouski, Canada), an algorithm specialist in Arctic waters, and George Wiafe (University of Ghana) whose expertise includes application of remote sensing for environmental management in Africa. The IOCCG extends a warm welcome to all our new Committee members. The full minutes of the 19th IOCCG Committee meeting are now available on the IOCCG website at www.ioccg.org/reports/Minutes-19-FINAL.pdf. The new IOCCG working group on Intercomparison of Atmospheric Correction Algorithms Over Optically-Complex Waters, chaired by Cédric Jamet, will be holding their first meeting on 14-15 May 2014, in Wimereux, France, at the Laboratory of Oceanology and Geosciences. The group hopes to intercompare and evaluate state-of-the art of atmospheric correction algorithms over optically-complex waters to understand retrieval differences. The goal is to provide recommendations for improving and selecting the optimal atmospheric correction for a given water type. A round-robin inter-comparison will be performed on three datasets (in-situ measurements, radiative transfer simulations and satellite observations) to evaluate performance. The overall goals of the kick-off meeting are to define which algorithms will be selected and which datasets will be used, to determine the schedule and role of each member, and to define metrics for the round-robin. The new IOCCG working group on Earth Observations in Support of Global Water Quality will be holding their first meeting in Washington DC on 9-10 June 2014. The WG aims to provide a strategic plan for incorporation of current and future Earth observation information into national and international near-coastal and inland water quality monitoring efforts. This will be accomplished by promoting best practices, coordination of efforts and partnerships, and proposing specific new linkages between data providers and data end-users. Ultimately, the intent is to work toward implementation of a global water quality monitoring service under the auspices of the intergovernmental Group on Earth Observations (GEO). The Second IOCCG Summer Lecture Series will take place at the Laboratoire d’Océanographie de Villefranche (LOV), in Villefranche-sur-Mer, France from 21 July – 2 August 2014. More than 140 excellent applications were received, but unfortunately only 23 students could be accommodated for logistical reasons. The Selections Committee had an extremely difficult task evaluating all the applications and making the final selections, given the number of applications that far exceeded the number of spaces available, and the general excellence of all the applications. The IOCCG would like to thank all the candidates for their outstanding applications, and also the IOCCG Selections Committee for their valuable input. Congratulations to the 23 selected students who hail from 16 different countries around the world. The IOCCG will once again provide online video recordings of all the lectures, together with the PowerPoint presentations, providing a useful resource for all those students who are unable to attend the training course, as well as other interested researchers from around the world. The 2014 NASA Ocean Color Research Team (OCRT) meeting took place from 5-7 May, 2014 (Silver Spring, MD, USA). NASA’s Ocean Biology and Biogeochemistry program utilizes remotely-sensed observations, as well as data from field studies and interdisciplinary data assimilation and modelling efforts, to better understand the ocean’s role in the Earth System. Ocean biology and biogeochemistry research supports mainly the Carbon Cycle and Ecosystem Focus Area of NASA. The agenda for the OCRT meeting covered a range of topics, including the current operating missions, competitions, upcoming solicitations, the PACE mission, the upcoming Decadal Survey, ICESCAPE, and short talks from ongoing projects. For further details, see the final agenda and consult the OCRT meeting website. NASA’s Ocean Biology Processing Group reports that it is working toward a reprocessing of all ocean colour missions. This will be the first reprocessing since 2009-2010 wherein product algorithms and file formats will be changed, which may have a significant impact on users. The Level-2 and Level-3 products from this reprocessing will be in netCDF4 format, rather than the current HDF4 format, and metadata will also be standardized to conform to a number of international standards and conventions. SeaDAS 7.0.2 is already compatible with these new Level-2 and Level-3 file formats, and no changes will be made to lower-level products (Level-0/1A/1B). The details and rationale for the format changes, and links to sample files, are provided on the NASA OceanColor website. The ocean colour reprocessing will likely begin with OCTS, CZCS, SeaWiFS, and MERIS, followed by MODIS/Aqua, MODIS/Terra, and VIIRS with some delays in between as they finalize temporal and vicarious calibration updates. The full effort once underway can be expected to take several months to complete, including the full suite of standard and evaluation products. The first of five instruments that will fly on JPSS-1, NOAA’s next polar orbiting environmental satellite, has successfully completed pre-shipment review. 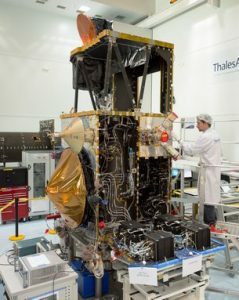 The Clouds and the Earth’s Radiant Energy System (CERES) will be on board the JPSS-1 satellite mission, which is scheduled to launch in early 2017. Other instruments to be carried on JPSS-1 include the the Visible Infrared Imaging Radiometer Suite (VIIRS), which will support the acquisition of high-resolution atmospheric imagery and will also provide an operational capability for ocean-colour observations and a variety of derived ocean-colour products. The entire bulk processed Envisat MERIS Level 1 Full Resolution Full Swath dataset (MER FRS – 300 m) is now freely available to users for direct download online. During the Envisat mission, acquisition of MERIS Full Resolution data was subject to dedicated planning based on on-demand ordering and coverage of specific areas according to operational recommendations and considerations. In order to give the users a better overview of the MERIS Full Resolution data coverage, global and yearly density maps have been generated and made available online. Bulk processing of the corresponding MERIS FRS Level 2 dataset is currently in progress, and a gradual release of the L2 data online is expected to start in Q2/2014. Access to the MERIS FRS L1 online dataset is provided upon Fast Registration. See also related Envisat News of 20 December 2013. ESA’s Sentinel-1A satellite was successfully launched on 3 April 2014, and will provide imagery of land and ocean surfaces of Europe, Canada and the polar regions in near-real time. The first radar images of Earth were delivered on 12 April 2014. ESA is reponsible for developing the family of Sentinel satellites and for ensuring that the stream of data are available for these services. ESA is thus convening the Sentinel-2 for Science Workshop to prepare for scientific exploitation of data from the mission (Frascati, Italy, 20-22 May 2014). Regarding the Sentinel-3 mission, engineers have been testing the multitude of components that make up Sentinel-3. The SLSRT infrared radiometer, one of the main instruments carried on Sentinel-3, was recently delivered. Furthermore, the development of the Ocean Land Colour Instrument (OLCI) is progressing well: the electrical tests are almost finished and will be followed by performance tests in a vacuum, simulating the environment of space. With 21 bands at 300 m resolution and offering global coverage in less than four days, OLCI will provide measurements to support Copernicus water quality and land-monitoring applications. The Sentinel-3 mission is designed as a two-satellite constellation for optimal global coverage and data delivery. Sentinel-3A is expected to be launched in mid-2015 and Sentinel-3B will follow about 18 months later. The two identical instrument packages and satellites are therefore being built and tested in parallel. Thomas Leeuw and Emmanuel Boss of the University of Maine recently developed a new application that allows iPhone users to take water quality measurements. 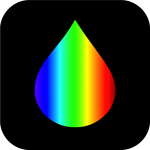 The app, called HydroColor, uses three images (an 18% photographers gray card, as a reference, a sky image, and a water image) to measure the reflectance of natural water bodies. Using this information, HydroColor can estimate water turbidity, concentration of suspended particulate matter (SPM) and the backscattering coefficient in the red. Additional water quality parameters (e.g., chlorophyll concentration) will be added to HydroColor as research continues. HydroColor calculates the reflectance of the water body in the RGB colour channels of the camera. It then uses the reflectance values to determine the turbidity of the water in NTU (nephelometric turbidity units). HydroColor is available from the Apple App store. For further information on how HydroColor works see the University of Maine website. Several new publications have been added to the IOCCG Recent References list, including a paper by Hongtao Duan et al. (2014) entitled Optical characterization of black water blooms in eutrophic waters. In the summer of 2007, blooms of “black” water in Lake Taihu entered into the potable water supply of Wuxi city and left more than 1 million people without water. Attempts to monitor these black water blooms have not been successful due to their irregular nature. In May 2012, two black water blooms were observed in one of the lake’s eutrophic bays. 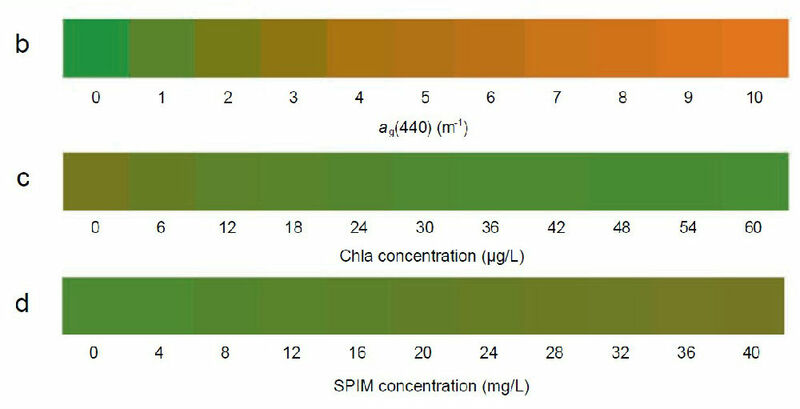 Colour of the water surface as a function of increasing concentrations of CDOM, Chla, and SPIM (click to enlarge). The bio-optical analyses of these blooms show that they were dominated by higher concentrations of dissolved organic matter and lower backscattering coefficients with respect to the surrounding lake conditions. The authors document the contribution of each optically-active component to the perceived radiance and demonstrate that elevated absorption due to dissolved organic matter and phytoplankton, combined with reduced backscattering, led to the perception of these water areas as “black”, while the true colour was dark green. The present analysis indicates that formation of black water blooms is favored during spring time conditions in the macrophyte-dominated areas of the lake’s hyper-eutrophic bays. In another new paper by Pravin and Shanmugam (2014) entitled “A new theory and its application to remove the effect of surface-reflected light in above-surface radiance data from clear and turbid waters”, the authors propose an alternate method to remove the surface-reflected light effects from both time series and discrete radiometric data in order to derive the desired water-leaving radiance data in a wide range of oceanic, coastal and inland water bodies under different sky and sun glint conditions. The new method proves to be a viable alternative, especially in circumstances when the above-surface measurements of radiances are severely contaminated by the surface-reflected light fields. 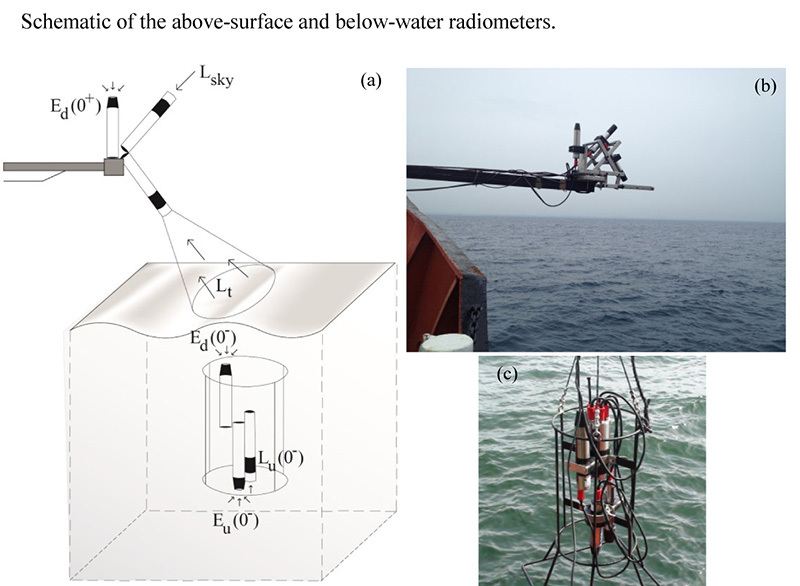 The new water-leaving radiances measured from the deck of a ship or boat in oceanic and lake waters are more accurate than those from existing methods, and can be used operationally for satellite sensor vicarious calibration and validation, and development of remote-sensing algorithms to understand interdisciplinary coastal ocean properties and processes. Schematic of the above-surface and below-water radiometers (click to enlarge).